It's been a couple of years since I've done any Comichron Flashback columns, but with the January 2013 data now reported, I wanted to look at resuming the effort during months when time allows. I've added a snapshot of what one retailer is charging for the top-sellers; Comichron isn't a price guide site, but sometimes it's interesting to see how once-popular titles held up. As always, this reflects what Diamond Comic Distributors (and, in earlier times, other distributors) sold to retailers, not what the retailers themselves sold. In recent times, retail inventory is much more tightly controlled, so the numbers are more representative of actual sales. In the distant past, not so much. For comparison with the past, this January's top title, Superior Spider-Man #1, had first-month orders of over 188,000 copies, as seen in the charts here. January 2012 was the best January since 2008 for comics orders, thanks to the ongoing DC relaunch, which was in its fifth month. Justice League #5 was the top seller, with nearly 138,600 copies sold in its first month; another 6,100 copies of the Combo edition were sold. By the end of the year, the total for the main edition was 148,500 copies. The top-selling graphic novel was the Batman: Through the Looking Glass hardcover. It had initial orders of more than 6,400 copies; that would rise to 7,400 by the end of the year. Click to read the original Comichron analysis for the month. And check out the sales chart for the month here. 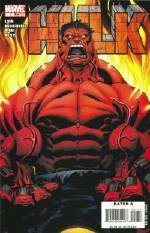 January 2008's top seller was was Hulk #1, with initial orders of 133,895 copies in the direct market. Later months brought it up to at least 139,800 copies. There were irregularities in Diamond's initial reporting that month that led to a revised list being published; in that list, Hulk #1's orders were combined with its Phoenix Comicon variant, allowing it to leapfrog the first "Brand New Day" issue of Amazing Spider-Man, #546. It came in second, at 127,856 copies in its first month. As of the time of this posting, the main version of Hulk #1 had an aftermarket price of $8 in Near Mint at MyComicShop.com. On the trade paperback front, Savage Sword of Conan Vol. 1 topped the list, with more than 6,200 copies ordered. The big comics news in January 2003 remained Jim Lee’s “Hush”: Batman #611 topped the list with preorders of approximately 129,400 copies; reorder months brought it at least to 142,500 copies. It was the second issue of the storyline to top the list, and six more issues would be in the #1 position before it was over. 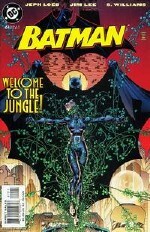 At the time of this posting, Batman #611 had an aftermarket price of $2.40 in Very Fine at MyComicShop.com. CrossGen was still active at this point; Sojourn #19 being its top entry at 80th place and 24,600 copies. DC and Marvel fielded smaller slates in this winter month — 76 new comics for DC and 49 for Marvel — resulting in a whopping 51 publishers placing titles in the Top 300, including names such as Gutsoon, Geek Punk, Peter Four, Girl Twirl, and Lumakick, to name a few. That compares with 22 publishers in January 2008’s list. And January 2003’s top trade paperback? A little book called 30 Days of Night — selling 6,200 copies to retailers, the first of many. It stayed on the top trades list for months. Check out the sales chart for the month here. January 1998 was deep within the comics recession, a year in which the “dead quarter” very definitely lived up to its name. Marvel was still fresh off its return of Avengers, Captain America, Fantastic Four, and Iron Man from its “Heroes Reborn” Jim Lee/Rob Liefeld experiment. Second and third issues of those titles, renumbered as “Volume 3,” each made Diamond’s Top 10, garnering preorders of between 108,000 and 139,000 copies. But the top-charting titles of the month were both issues of X-Men — Uncanny X-Men #353 and “adjectiveless” X-Men #73, at 154,400 and 148,600 preordered copies respectively. Spawn #70 was in fourth place, the first of four Image titles in the top 12 (including Witchblade, Darkness, and Curse of Spawn). 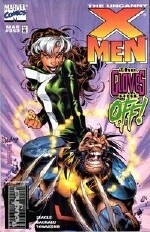 At the time of this posting, Uncanny X-Men #353 had an aftermarket price of $2.30 in Near Mint at MyComicShop.com. DC’s only items in the Top 25 were three JLA titles. But DC outpaced Marvel in the overall dollar shares, 27.56% to 27.41% — a consequence of DC’s much larger backlist of trade paperbacks in those days; in terms of sheer numbers of releases, Marvel was relatively later to the TPB party. Marvel’s comics line was thinner as well in this Chapter 11 era for the publisher: DC had 77 titles in the Top 300, while Marvel had only 50. Marvel, DC, Image, and Dark Horse accounted for 70% of dollars of product preordered in the month. There were 40 publishers placing books in the Top 300, as opposed to 22 in January 2008. While Marvel, DC, and Dark Horse dollar shares were lower in January 1998 than they are today, Image’s was higher, at 11% — WildStorm still a part of the company at that point. The top-selling trade paperback was the Divine Right Collected Edition from Image; this was the last month that Diamond did not report sales figures with trades, so we don't know how many copies it sold. In February 1998, Diamond began reporting sales data for trades. While we don't know details on Image's overall sales, we do know a bit more about Marvel's in this era. Archival documentation pegs the Direct Market sales of Amazing Spider-Man #375 at 914,300 copies, not counting newsstand: that's enough, according to this report, to make it the top-selling issue of Amazing Spider-Man of all time to date. Given the relative position of it and Darker Image at Diamond and Capital, that would seem to put Darker Image at between 1.1 and 1.2 million copies in the Direct Market. Overall, though, since Marvel had a stronger newsstand presence than Image did — plus subscribers — Amazing Spider-Man #375 probably actually had more copies in circulation. As speculators in those days learned, a lot of copies doesn't make for investment value. At the time of this posting, Darker Image #1 had an aftermarket price of $1.10 in Near Mint at MyComicShop.com. Amazing Spider-Man #375 fares somewhat better, at $4 in Near Mint. At Diamond, the top graphic novel was the first Books of Magic collection. Check out the sales rankings for the the overall year here. January 1988's top seller at Capital City was Uncanny X-Men #229. The issue had orders through that distributor of 71,800 copies. According to archival sources, total Direct Market orders for the issue were 296,100 copies, with another 109,800 copies moved through the newsstand; all channels, including subscriptions, brought the title to orders of just over 450,000 copies. At the time of this posting, Uncanny X-Men #229 had an aftermarket price of $3.30 in Near Mint at MyComicShop.com. But while Marvel had the top title, DC led the market share by what Capital City called "a record" 13 percentage points, 42.62% to 29.62%. According to the distributor, Marvel cut its production back greatly for January 1988 and increased prices on most titles from 75¢ to $1: DC also led graphic novel sales with the $50 Watchmen hardcover limited edition. Capital appears to have sold 2,322 copies of the book in the month, meaning it made 62% more money than Uncanny #229 made. We're back before the Direct Market distributor charts — the ones I have from Capital start running data in 1984 — but January 1983's top seller was almost certainly Uncanny X-Men #169. The average issue of the title sold 336,824 copies in 1983 according to postal statements, but it's early enough in the year this issue's sales are probably closer to 1982's figures, which were lower. Between 325,000 and 330,000 copies through all channels seems a good estimate. At the time of this posting, Uncanny X-Men #169 had an aftermarket price of $3.40 in Near Mint at MyComicShop.com. Once we get to 35 years ago, the data is spare, and it becomes trickier to judge what items came out in the same month. (I'm not looking at cover dates here, but likely ship dates, to keep things squared up with present practice.) The known information is incomplete enough that most of what follows is conjecture. A good guess for January 1978, however, would be Marvel's Star Wars #10, which between newsstand and Whitman bagged editions would have likely sold close to 400,000 copies. Back 40 years ago, there was no issue in January 1973 of Archie (which appeared from postal statements to lead the industry in 1973, still hanging onto its cartoon publicity). That'd likely put Superman #262, whose average annual sales were 309,318 copies per issue, on top. And again, relying on the Postal Statements, for 45 years ago we're likely looking at Superman (636,000 copies average in the year) — but if there wasn't a Superman issue shipping in January, which appears to be likely, then we'd probably be looking at Archie #180 (566,587 copies average). And 50 years ago we don't have Superman data, because DC didn't publish it — but it's likely the industry leader at around 640,000 copies. If not that, then Superboy — likely, issue #103, selling slightly fewer copies.